In general, I don't feel like I'm a picky person. There's enough worry in my world already, so I don't want to be fastidious if I can avoid it. But when it comes to my passions - coffee, art or beauty products - I want more. No matter what price point is in question, I want the performance and experience to be memorable and make me look forward to each use or application. Nowadays the beauty market is so saturated witl lukewarm, mediocre or plain "nice" products (that tend to bore me to death), so I feel like I'm allowed to be a bit picky. Today I'm happy to review one of those products that makes you sigh in awe. This light yellow balm comes in a 30ml (~ 1.01 fl. oz.) jar and retails for €120/ ~$148.70/ ~£106.45. Available on these sites with International shipping (non-affiliate links): Max and Me (Vienna), So Natural Beauty (Belgium), Naturelle (Finland) and Beauty Heroes (USA). The jar is a sturdy, opaque violet glass (similar to miron glass) with a beautiful fairy illustration. Miron/violet glass absorbs the complete spectrum visible light exception for the violet part and protects the the balm from external influences. Made in Vienna. Also available is Sweet Serenity 'Rescue Balm', which is 1/2 the size. As you may notice, most of the ingredients are either organic or wild-crafted, the highest quality possible. The first ingredient is shea butter, which is a wonderful moisturizing agent as it's packed with skin-conditioning fatty acids (oleic, stearic and linoleic). Shea butter also very occlusive and prevents loss of water by forming a protective barrier on the skin's surface (but not a greasy film by any means). It's wonderful for soothing tight, irritated, flakey or itchy skin as well as relieving sunburns and windburns. It doesn't liquify in room temperature, but softens in the warmth of your hands. Like with all ingredients, I've read people breaking out from shea butter. While stearic acid is comedogenic, shea butter alone isn't. In fact, shea's anti-inflammatory and conditions the skin, which can be good for acne sufferers. Personally I have no bad experience with shea, but if you're concerned and haven't used this ingredient before, I'd ask a sample to be on the safe side. Sweet Serenity Beauty Balm is also packed with several other carrier oils including rose hip oil, tamanu oil, argan oil and exotic murumuru seed butter - to name a few. All of these oils and butters are highest quality and carefully harvested. I'm very excited about the murumuru butter as it's also very protective occlusive ingredient with highly moisturizing oleic acid content. I can't stop loving plant oils and butters as they're also packed with antioxidants and vitamins while the fatty acids are rejuvenating and repairing the skin. I'm very happy about the variety of carrier ingredients in the Sweet Serenity Beauty Balm. As I don't much about energetic properties of essential oils, you can read more on their website. I use my cosmetic spatula to take out maybe ~1/2 pea-size amount of the balm and melt it by gently massaging the balm between my fingers. I bring my hands close to my nose and take a deep breaths inhaling the wildflowery scent before applying the molten balm on my face. Sometimes when I'm tired I plainly massage the balm straight on my face as it melts easily without rubbing or tugging. Balms can be used during daytime but I tend to save them for evenings and apply liberally. You can feel the light occlusive barrier on your skin after application, but nothing that's slipping and sliding (or staining your pillow case). The Sweet Serenity balm absorbs into my skin with no problem; next morning my skin feels nourished and plump. 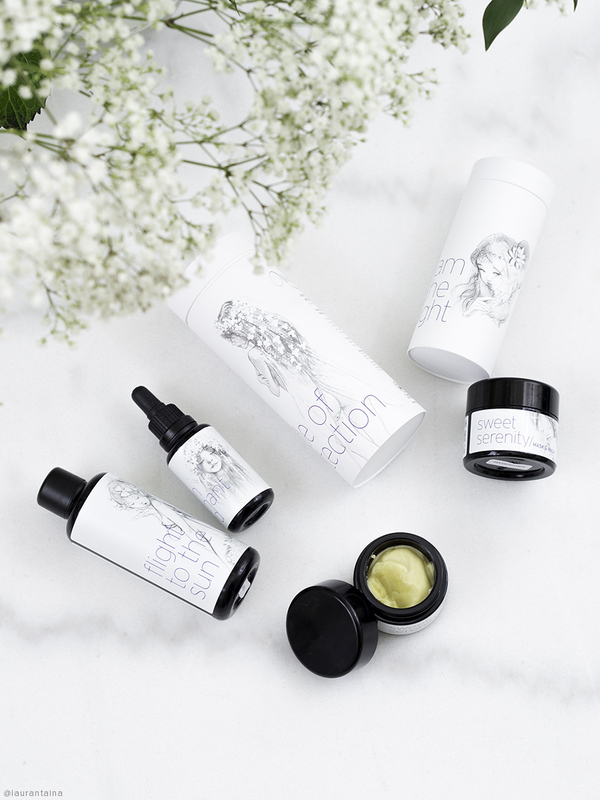 To get my dry skin extra glowing and soft I often layer the Sweet Serenity Beauty Balm with the Luxe Botanics Marula serum or the Max and Me Enchanted oil, but if you're normal to oily the balm may be enough on its own. If you love to layer skincare: hydrating essences, serums and sheet masks go excellently underneath the balm. The scent is distinguishable, but not sharp or overpowering like many essential oils are. You know how perfumes have top, heart and base notes that compliment each other? I feel there's something similar with the scent of this balm as it unveils its layers slowly, layer by layer and lingers sweetly. I can pick up sandalwood and ylang-ylang notes. I'm not a big fan of lavender, but fortunately the wild mountain lavender isn't as strong or sharp. I much prefer this type of light and soft scent experience VS something strongly fragranced. I reach for the Sweet Serenity Beauty Balm especially when I need to treat my thirsty skin or when I'm feeling flakey, stressed or needing extra protection after using harsher ingredients in my routine (such as acids or retinol). My skin isn't particularly sensitive or easily irritated, but I believe this balm would suit beautifully for these skin types as well (if you're not particularly sensitive to essential oils). Max and Me products give me that extra wow-factor so many conventional beauty products lack: the "ahh" feeling of relief, relaxation and pure bliss. I would describe that Max and Me line does not only provide excellent beauty products, but an experience - perfect if you want to invest in your self-care routine. I feel I'm being pampered, nourished and blessed with nature's finest ingredients. I don't want to sound all woo woo, but you can feel the love that's poured into making their handmade products. Max and Me describes its line "highly vibrant" for a season. Love this balm, will repurchase! Have you tried Max and Me? What's your favorite beauty balm? *I've bought this product with my own money, however, I've kindly received other PR from the brand. My thoughts are always 100% honest and my own.